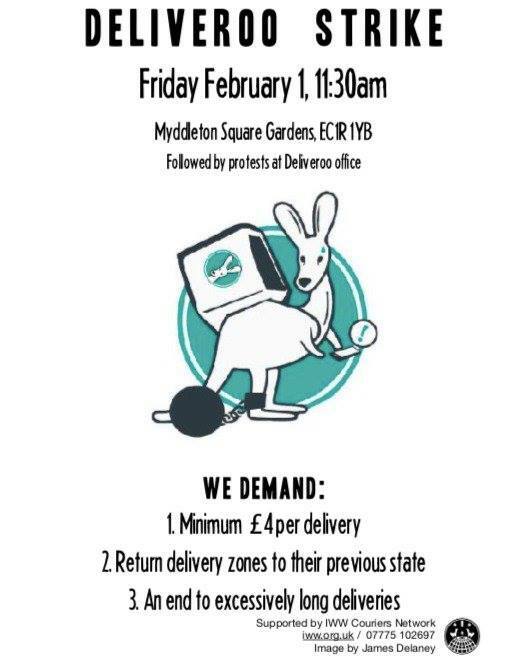 On Friday 1st February, Deliveroo couriers in Bristol will be striking for a range of demands. They’ve said that couriers in at least 5 cities will be taking part in the action, so far the only other one I’ve seen confirmed has been London. People in London are meeting up at Myddleton Square Gardens, EC1R 1YB at 11:30am, the Bristol couriers are meeting at College Green at 6pm. Please donate to their strike fund here. There’s a range of ballots and potential disputes going off in the education sector, with over 80% of National Education Union members saying they’re prepared to take strike action over school funding, the UCU carrying out a ballot of members at 143 universities, and Scottish education union EIS also balloting members over pay. As part of their plans for 2019, the Angry Workers of the World have a few events coming up, with a Mike Davis reading group on the 7th and a meeting with a Brazilian comrade on the 14th. Upcoming discussion events of interest in the Midlands include the Anarchist Communist Group’s event on “Visions of society without government” in Leicester on the 2nd, “The Meaning of Anarchism pt 2” in Nottingham on the 4th, although that’s apparently now fully booked, and a meeting in Leicester about Samsung’s union-busting and the campaign against it on the 20th. If anyone can make it to Chelmsford Crown Court on the 6th, the Stansted 15 will be facing their sentencing then. As well as their involvement in the upcoming couriers’ strike, the IWGB have a fair few other things going on: their newly-formed electrical workers’ branch is meeting at the end of January, so there’s likely to be more news from them soon, and minicab drivers organising through the IWGB are holding a series of disruptive protests against the proposed extension of the congestion charge to minicabs, with the next planned for Feb 4th. Meanwhile, Games Workers Unite are holding their first meeting in the East Midlands on the 2nd, and at the end of the month, the IWGB and UVW, together with a few local branches of other unions, are calling for a national demo against outsourcing on the 26th to coincide with a big day in court where the IWGB will be taking on the University of London and the government. Grassroots cleaners’ union CAIWU are striking against job cuts at Virgo Fidelis convent school on the 6th. Upcoming antifascist events include a “ravers against racism: reclaiming the yellow vest” callout against the yellow-vested, red-hatted fash who’ll be visiting Newcastle on the 2nd, Leeds Anti-Fascist Network mobilising against a return visit by their local fash the same day, an antifascist assembly in London on the 10th, weekly “cantifa” fundraiser nights every Wednesday in Brighton, and a Leeds Anti-Fascist Network film night and social on the 14th. You can read Leeds AFN’s report on a recent outing by the “yellow vests UK”, complete with nazi salutes and British Movement flags, here. The Outlive Them network of Jewish antifascists have called for people to mark a number of dates with actions – Holocaust Memorial Day has just passed, so the next will be March 8th and March 16th. The RMT “keep the guard on the train” dispute continues with weekly strikes every Saturday on Northern Rail, and a mass lobby of the Transport for the North board, along with a public meeting, in Chester on the 7th. Meanwhile, a ballot for further action is running on South-Western. 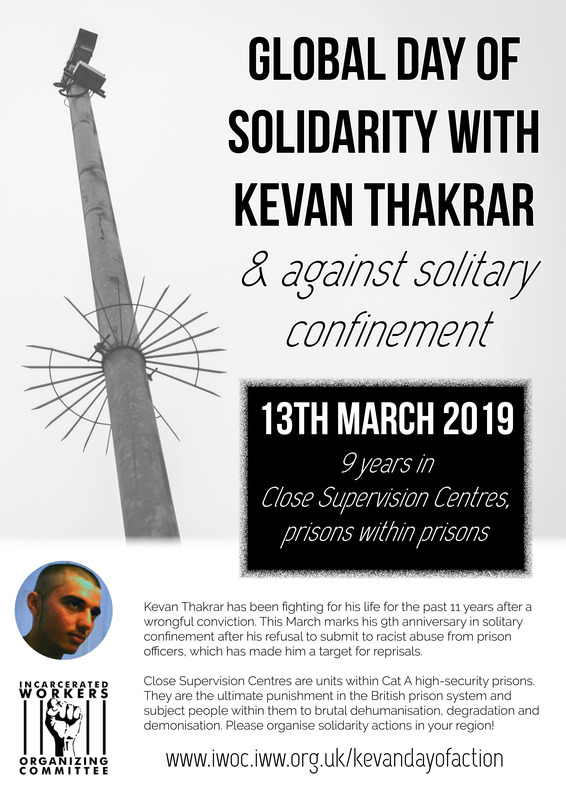 London ABC have called a demo at HMP/YOI Bronzefield for the 14th, with other upcoming prison abolition/prisoner solidarity events including a day of solidarity with Kevan Thackrar and against solitary confinement on the 13th of March, a call for a whole month of action against prisons and the state in memory of Anna Campbell throughout March, and a call to take action against prison construction throughout the year. The Chav Solidarity book tour has more upcoming dates, visiting Leeds on the 7th, Manchester on the 27th, Liverpool on the 28th, and Edinburgh on March 5th. Saturday 2nd: Rave against racism vs the neon nazis and fluorescent fash in Newcastle, Leeds AFN taking on similar wrong’uns there, anarchist discussion in Leicester, games workers organising in Nottingham, RMT strikes on Northern Rail every Saturday for the forseeable future/until Northern agree to keeping the guard on the train. Monday 4th: “The Meaning of Anarchism pt 2” in Nottingham (fully booked tho), mass minicab drivers’ action in London. Wednesday 6th: court solidarity with the Stansted 15, cleaners striking against job cuts at Virgo Fidelis school, antifascists drinking tinnies every Wednesday for the forseeable future in Brighton. Thursday 7th: Angry Workers of the World host a class-struggle reading group in London, Chav Solidarity book tour in Leeds, RMT lobby of Transport for the North/public meeting about the dispute in Chester. Thursday 14th: Angry Workers of the World meeting with a Brazilian comrade about the situation there, noise demo at HMP/YOI Bronzefield, Leeds Anti-Fascist Network film night and social. This entry was posted in Anarchists, Protests, Racism, Strikes, The right, Unions, Work and tagged Anarchist Communist Group, Angry Workers of the World, Anti-Fascist Network, CAIWU, Chav Solidarity, couriers, Deliveroo, Incarcerated Workers Organizing Committee, Industrial Workers of the World, IWGB, IWGB Couriers and Logistics Branch, Kevan Thackrar, London Anarchist Black Cross, Outlive Them, rmt, Stansted defendants. Bookmark the permalink. 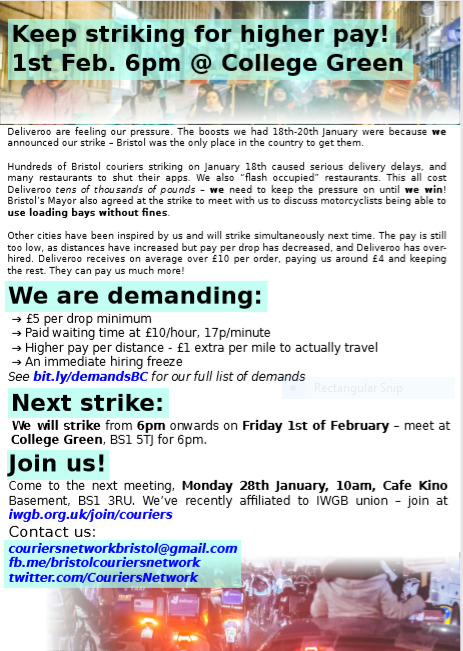 Pingback: Deliveroo couriers to strike in Bristol and London on February 1st, and events diary for February — Cautiously pessimistic | Anarchy by the Sea!